If you have ever thought about leaving your home country and emigrating, I bet New Zealand was on the short list. Since 2010, New Zealand has seen, amongst other nationalities, 10,000 Americans and 42,000 British get off the plane in Auckland or Wellington and prepare to spend their future living in New Zealand. Some of those immigrants last only a few years; they decide that New Zealand isn't the place for them and head back home. Usually complaining that they can't get decent bacon. But some, like us, stay and make 'the land of the long white cloud' their home. Living In New Zealand. The Pros And Cons. My family (husband and two kids) have been living in New Zealand for the past nine years, we emigrated from the Uk in 2010 and now New Zealand is home. We all love it and are very happy here but there are a few things that can get on your nerves. Apart from the bacon. This podcast is a discussion between Sonny and I where we look at what we like (and what annoys us) about living in New Zealand. Sonny says a few things about New Zealand that I don't agree with (like the internet being rubbish?! I don't think it is) but that's the beauty of this Podcast; to get two different perspectives. One from a cocky young buck and the other from a stuck-in-her-ways- old biddy. Outdoor time is a huge priority in New Zealand. When we lived in the Uk people would talk about what new chain had opened up in the high street or whether you had been to the fancy new mall that you had to spend three hours in the carpark queuing to get to. Living in New Zealand will instead see you talking about the size of the surf, the hiking conditions, if the weather is right for fishing or (and this is a biggie) your kid's sport. This was a bit of a learning curve for me as both my kids are lazy little sods and hate playing sport. We do love hiking as a family though so that solved that little problem. House prices. We talked about the cost of living in New Zealand in our previous podcast so if you want to know more about prices, go and listen. I also wrote an in-depth blog post about how much wages were and how far your money will go in New Zealand and I recorded a vlog on the subject so I won't speak too much of it now. Let's just say - house price wise - you get a lot more bang for your buck than in the UK. So far away. Not sure if this is a con or a pro though. Depends on whether or not I am in favour with the rest of the family. Time difference. referring to the UK here - America is only (only she says) 18 hours behind, you can still make that work - the UK, on the other hand, is a pain. When you've had a glass of wine at night they are eating their Weetabix, putting their important heads on and mouthing to each other about how they think you're an alcoholic who lives on the other side of the world. 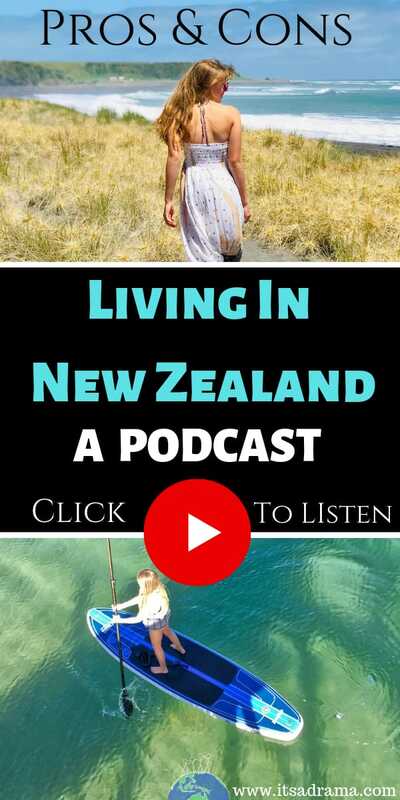 If you want to know more of the things that we like and don't like about living in New Zealand then please take a listen to the podcast. It's twenty minutes long and will be a massive help if you have ever dreamt of packing your bags and heading down under!